Datasets produced by user communities in various scientific fields rely on different standards, approaches, and logical organization of links between data. Ontologies and Semantic structures and tools have been developed to improve data sharing, interoperability and data discovery. The Workshop aims at bringing user communities from Life Sciences, Climatology and Digital Cultural Heritage together by providing them a stage for sharing knowledge, good practices and experiences. The Workshop will build on the capacities that two H2020-funded projects, VI-SEEM and SIMDAS Phase 1, generated. The VI-SEEM Project has created a unique Virtual Research Environment (VRE) in the SEEM region, with special focus on the scientific communities of Life Sciences, Climatology and Digital Cultural Heritage, providing them with a wealth of datasets sourced from various fields and user communities in the region. SIMDAS Phase 1 aims at creating a Center of Excellence on Simulation and Data Science. 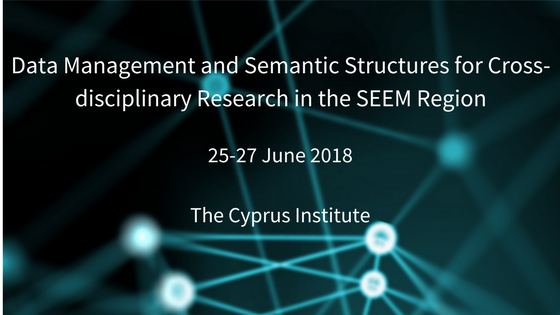 In the context of SIMDAS, the Workshop will reflect on the state of the art in data management and semantic structures in order to enable scientific breakthroughs in the key areas of Digital Cultural Heritage, Health and Life Sciences, Solar Energy, Earth System and Physical Sciences in the EM region. Both projects cover the SEEM geographic area and share similar enquiries and processes, such as methodologies, tools and services, data management, mining, data sharing and security, and workflows for data intensive-science. Therefore, we would welcome contributions to the discussion from, but not limited to, the fields of Cultural Heritage and Archaeology, Digital Humanities, Health and Life Sciences, Climate, Geographic Systems as well as Physical Sciences. This Workshop is addressed to researchers, scholars, students and professionals.